Dimensions 1.25 by 8.75 by 10.75 in. 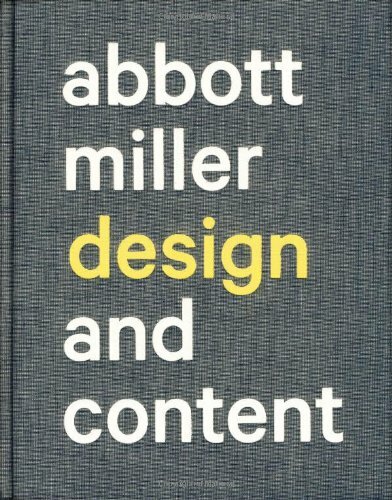 Amazon.com description: Product Description: Abbott Miller: Design and Content is the first monograph on the award-winning graphic designer known for his innovative work at Pentagram, where as a partner he leads a team designing books, magazines, catalogs, identities, exhibitions, and editorial projects, creating work that is often concerned with the cultural role of design and the public life of the written word. Collaborating with performers, curators, artists, photographers, writers, publishers, corporations, and institutions, Miller has created a unique practice that alternates between the printed page and the physical space of exhibitions. In his work as an editor and writer he pioneered the concept of designer-as-author, both roles he assumes for this beautifully produced and lavishly illustrated edition. Miller presents his work as a catalog of design strategies, emerging from the unique circumstances of form and content. Four categoriesâbooks, exhibitions, magazines, and identityâprovide insight into Miller's influences and working process while also showcasing his best designs. About: Abbott Miller: Design and Content is the first monograph on the award-winning graphic designer known for his innovative work at Pentagram, where as a partner he leads a team designing books, magazines, catalogs, identities, exhibitions, and editorial projects, creating work that is often concerned with the cultural role of design and the public life of the written word.